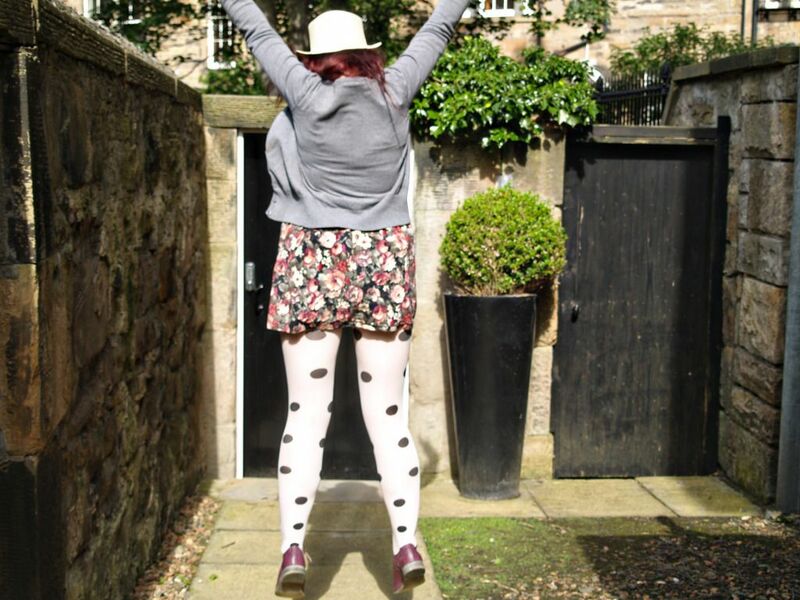 I think I'm falling in love with these spotty tights. I've been wearing them with pretty much everything lately. Trying them out with different patterns, different colours, and they go with everything! It's a pity I bought them on sale in Primark nearly six months ago, I wish I had bought another ten pairs. (While beautiful the quality is pretty awful, I can't see them lasting till the end of September). The shoes and hat are from my super cheap trip to Primark last week, I took the ribbon off the hat because it was just a little bit too girly for me, I think I might add a navy ribbon at some point soon instead. I've had such a lazy weekend, it's been fantastic. Me and the French were both feeling really low on Saturday so we spent the entire day hiding out at a friend's house watching the last of Stargate SG1 and eating lots of ice cream and cheese cake. I think our current state of homelessness in beginning to reallly get us down. We're so lucky we have so many good friends willing to take us, and the two dogs, in but I will be so happy when we are in our own place, nicely settled. I just want to have my own bed, a nice wardrobe to hang up my clothes (they are still packed up at my parent's house) and maybe even somewhere I can have a bath. Today is going to involve lots more sorting of our stuff and then maybe a bath this evening. The French leaves again for work early tomorrow morning so it will just be me and the dogs sorting out the move this weekend. Hopefully by the time he get's back at the end of next week we'll be all settled in. And I'll have some more time to catch up on blogs, I've been pretty terrible at getting back to you all recently and for that I apologise. I hope you are all having lovely Wednesdays. 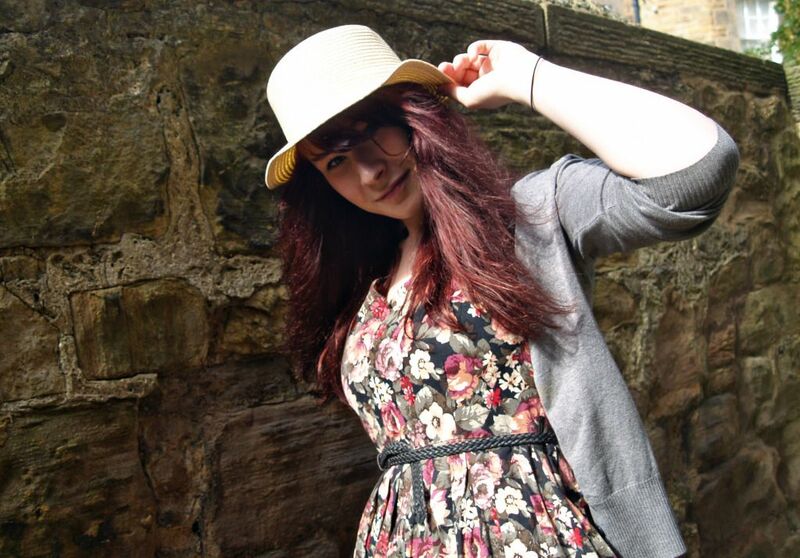 Cute dress :) Your hat is pretty awesome too! Lazy weekends are my favourite <3 nothing can beat a day dedicated to watching tv, eat delicious food and hang around with the people you love. You look adorable, hun. 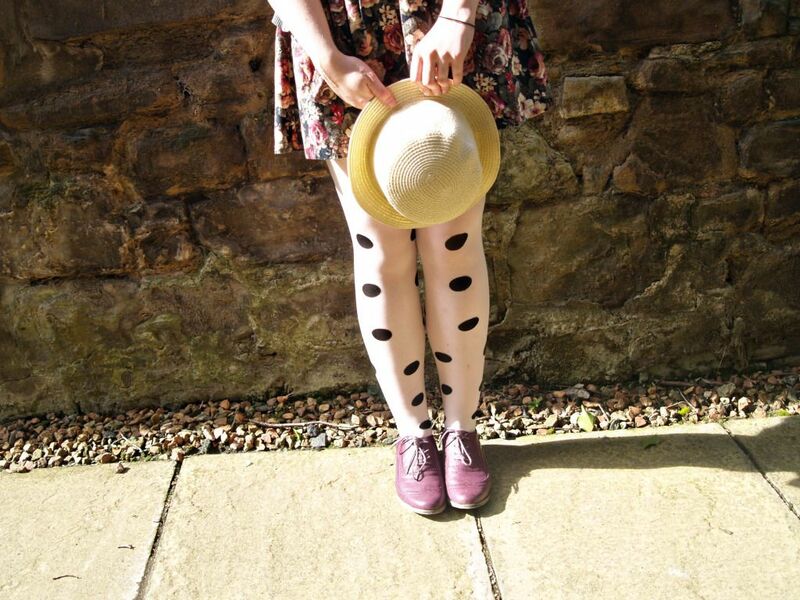 :) The polka dot tights are super fun. Look at how cute you are! I hope you can find some more tights- I hate when I ruin a pair I really love! I'm in love with those tights too! So lovely! Your blog name is awesome too! 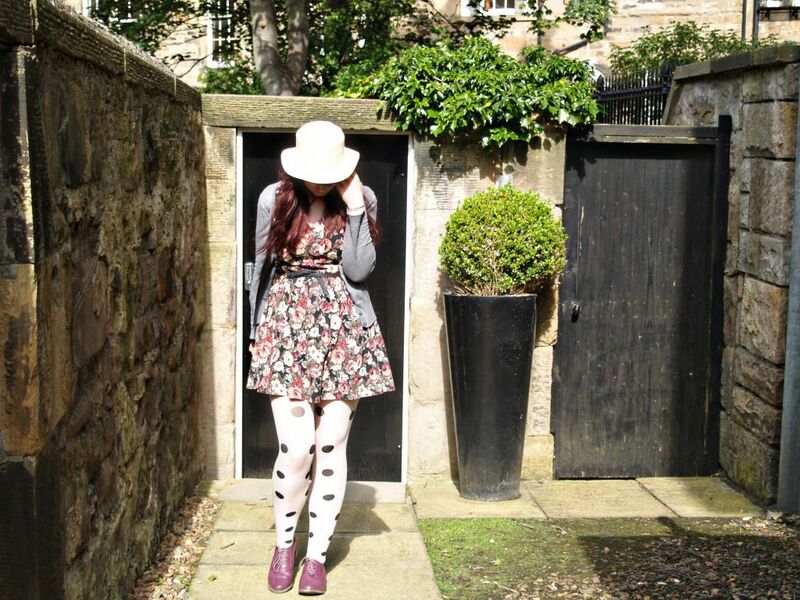 Such a cute outfit; really digging those tights!